As you can see from this shot, I’ve decided to pick the shawl back up again. I continue to have problems with it, but it is user error, rather than instructional, and at least I’ve loosened up my tension enough that I can move the stitches on the needle again. A sure sign these days that I should put knitting down and not pick it back up again until I’m less anxious. I am coming up with a game plan for knitting this year, which involves socks and abandoned UFOs and finishing a sweater, and I’ll let you know more in the coming week or so. I’ve mostly moved on to new reading this week. The Harry Potter continues to be picked up for a chapter here and there. They did not issue the fourth book in illustrated format this year, so I will have to either switch over to my original tomes (not a problem after I take down the Christmas so I can once again reach where the four of them are on my shelves) or wait until next year to read the next one. Luckily, I do not have to make a decision one way or another until I am so moved to revisit the Tri-Wizarding Tournament. The Best We Could Do by Thi Bui is a graphic memoir about her Vietnamese family who immigrated to the U.S. in the late 1970s. The Emissary by Yōko Tawada (and translated by Margaret Mitsutani) is a novella focusing on a dystopian future in which an as-yet unnamed environmental disaster has left children unbelievably delicate. Mumei lives with his great-grandfather, Yoshiro, who literally has more pep in his step than his young relative. It just won the National Book Award for translation and has been described as delightful, funny, joyous, and playful, so I’m eager to find out why. And finally, I have a new audiobook on the go as well, having just finally started The Woman Who Smashed Codes: A True Story of Love, Spies, and the Unlikely Heroine who Outwitted America’s Enemies by Jason Fagone about the preeminent American codebreaker responsible for the capture of numerous Nazis. Right now there are no Nazis in sight and she’s on the estate of an eccentric Illinois millionaire who has brought her there to help his wife prove there’s a secret code embedded in Shakespeare’s plays that proves they were written by Francis Bacon. Enjoyable starts, all. 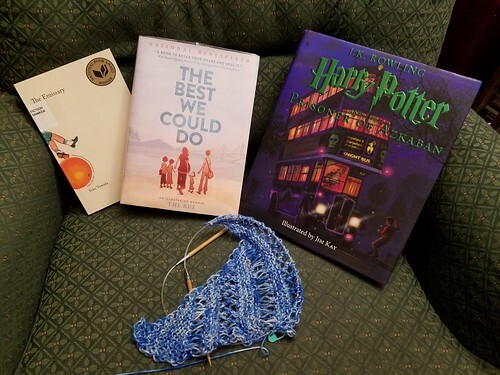 Check out As Kat Knits to see what everyone else is reading and knitting. You continually stretch my reading to new genres and that is such a good thing! Thank you!